One of the small appliances in my kitchen that I really rely on is my slow-cooker. It allows me to slave over a hot stove all day long without slaving over a hot stove. But if the power goes out, that slow-cooker is a paperweight. Did you know there is a non-electric alternative to a slow-cooker? Known as "straw box cooking" or "fireless cooking," an insulated box holds your cooking pot while the food inside the pot cooks. In the original form, straw was stuffed around the pot inside the box as insulation. I'd read about it in an old book, and when we had an ice storm a few years ago that knocked out our power for over 68 hours I was ready to give it a try, DIY style. The weather forecaster had warned us that this might be "one of those storms," so I was prepared. I started lamb stew in the slow-cooker that morning, and when the power went out I quickly moved the "crock" of hot food into my improvised straw box cooker: an ice chest/cooler lined with a blanket, plus a folded bath towel in the bottom of the chest. I put the lidded crock of hot food on top of the folded towel, covered the crock with the blanket and tucked it all around the sides, then closed the cooler lid. 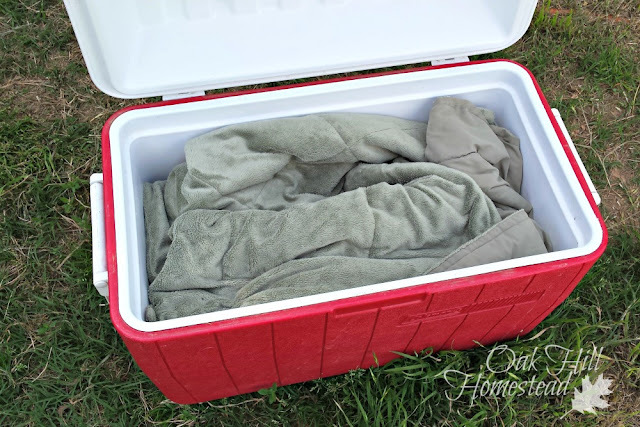 Line the cooler with your blanket. nestle your cooking pot inside. Cover it all with the blanket and shut the lid tight. the goal is to stuff as much insulation inside as possible. By dinnertime the stew was finished, hot and ready to eat. Success! The next day we heated our food to a boil on the camp stove, then moved the whole pot to the cooker. Success again! The folded towel on the bottom of the cooler insulates the bottom of the pot. A really thick layer of newspaper (like a Sunday paper) would also work. 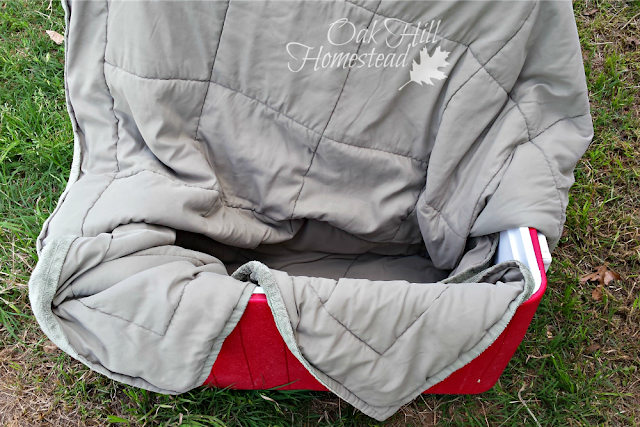 The blanket helps hold the heat, and closing the lid of the cooler tightly creates an insulated box. 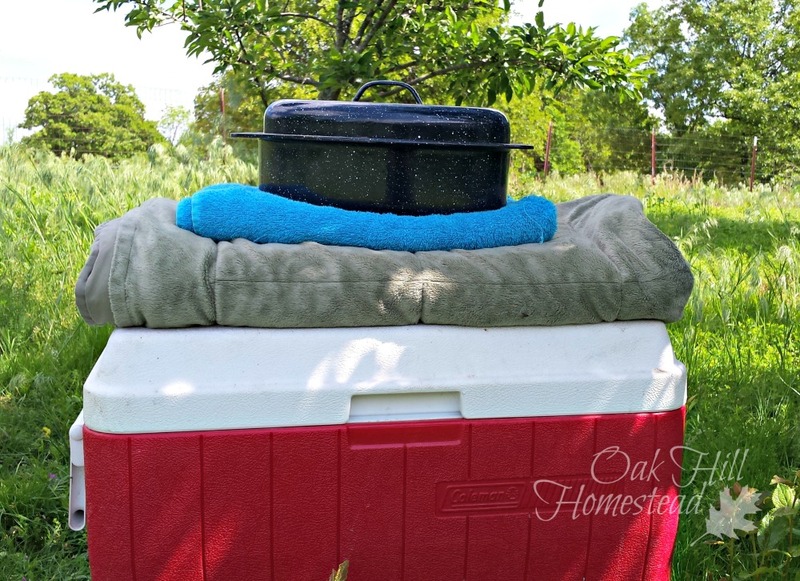 Just bring your food to a boil before placing the cooking pot in the ice chest. We used a camp stove (affiliate link) to do this. 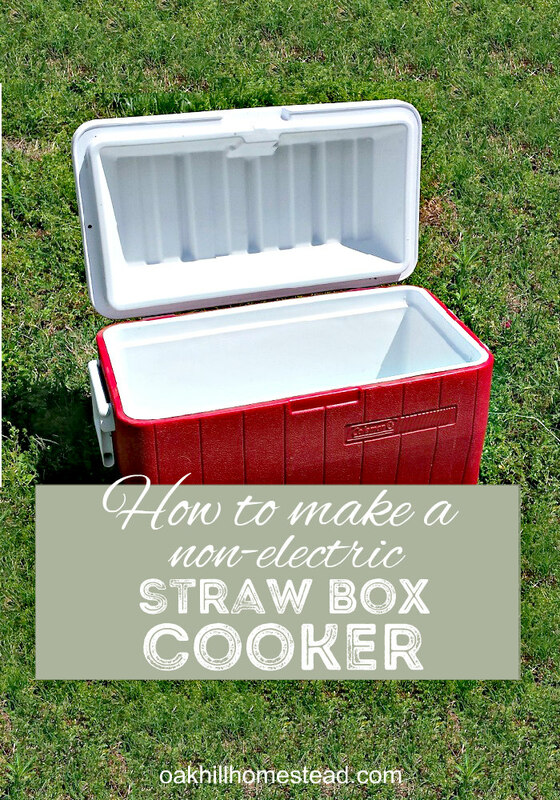 You do need a source of heat to use a straw box cooker, but the fuel needed is minimal because once you've moved your meal into the ice chest you won't need any heat at all to continue cooking your meal. This is all you need to cook in a "straw box". Wouldn't it be great to take camping? Soups and stews are excellent meals to prepare this way. On the second day of that ice storm power outage I opened a quart Mason jar of chicken and broth I'd pressure-canned, added a can of great northern beans, some dehydrated mushrooms and onions, and spices for white chili. After bringing it to a boil on our camp stove, I transferred it to the straw box cooker, where it simmered away all day long. Dinner was delicious! When your meal is finished, leave the top of your ice chest open for a while to dry it out; it's steamy and damp inside. Air out your blanket and towel before storing to prevent mildew. 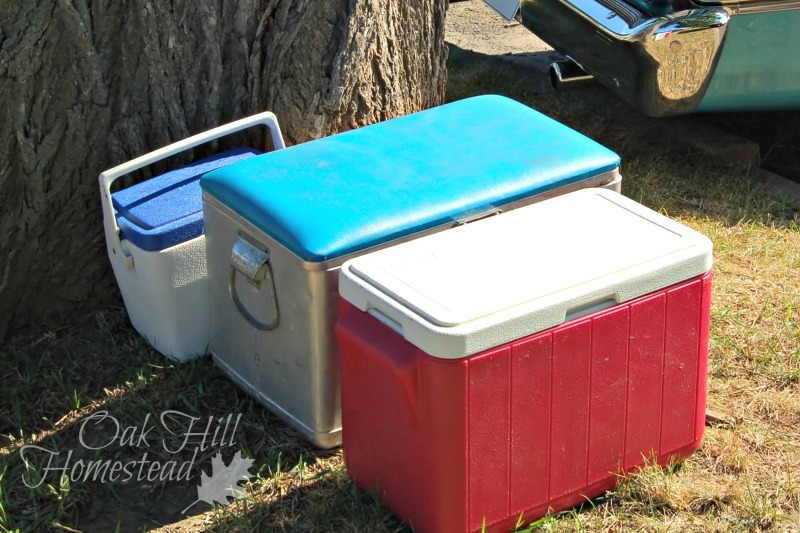 Ice chests can often be purchased for $5 or so at yard sales, and you can use the pots and pans you already own, making this a very inexpensive alternative to a slow-cooker... and you don't have to wait for a power outage to use it. 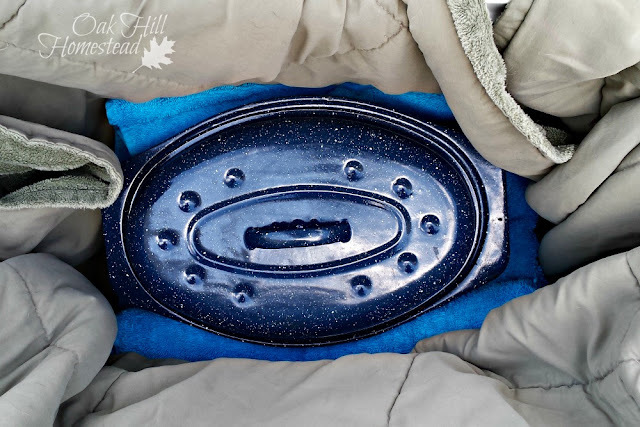 It's an excellent way to take a hot dish to a potluck supper, to a picnic in the park with family or friends, or on a camping trip. It's also a frugal way to save money on your electric bill, just bring your dinner to a boil, then transfer into your prepared cooler to cook until dinner time. Share this with someone who needs to know! Thanks, great article. Although we don't lose power as often as you do, I'm all for saving electricity. Saving electricity is a great reason to give this a try, Suzie. I'm really happy to have this information because it is always smart to be prepared and this is such an easy, easy way! It IS simple, isn't it? You probably already have it all too, right? Brilliant! I'm having a "smack my head" moment because I've been wanting to try a straw box/wonder box but didn't even think of using the ice chests and blankets we already own. Thank you for sharing this idea! You're so welcome, Leigh. Let me know what you cook first and how you like it! Thank you for this article! I found you on the Chicken Chick link party. I'm going to try this when it warms up enough here in the Black Hills of SD for a fishing weekend. You're welcome, Romi. Thank you for stopping by. I hope you have a great fishing trip this summer. Wow - I had never heard of this before, thanks for sharing! 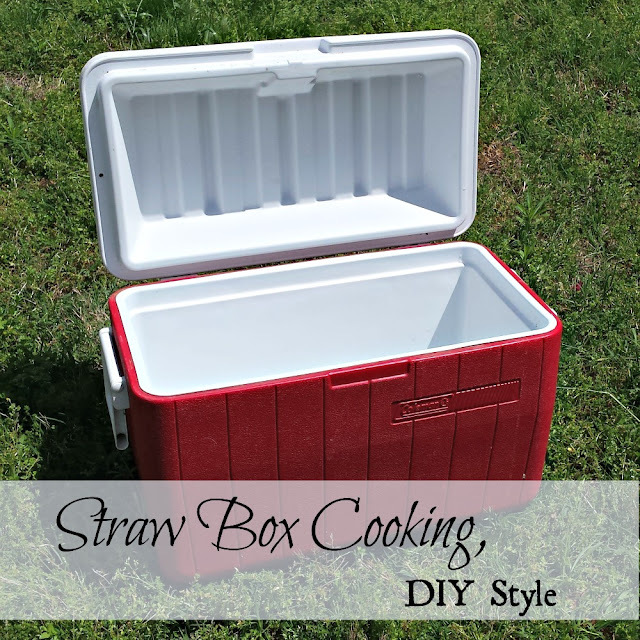 Straw box cooking has been a well-kept secret. It's been around for about a century and yet, not many people have heard about it. The price is sure right though, so it's definitely worth a try, SJ. I did not know you could do this! What a fantastic way to keep the family fed during snowstorms, blackouts and power failures, Kathi! Thank you for sharing this post with us at the Hearth and Soul Hop. Yes, it is, April... and easy and cheap too! Cool! It's so great to follow. Thanks. Thank you, Brian. I hope it was helpful. Oh My Goodness ... I've never heard of this straw box cooking either (as others have mentioned). We were without power for almost two weeks one winter. We were fine with our camp stove and fireplace, but this will not only save propane, but the idea of using less electricity and saving money is perfect. 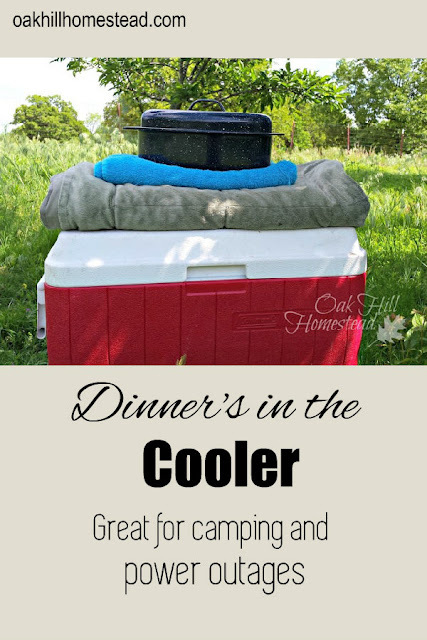 How about using it in the busy months too - get it started in the morning, wrap it up and put it in the cooler and when you come in from the garden or tending to livestock, dinner is ready! I'm definitely going to give this new (to me) method of cooking a try this summer. Thanks so much for sharing this great idea. And it won't heat up your home in the summertime, Bobbie. That's a real plus here in the South. Very interesting! I have never heard of this cooking method. Stopping by from the Country Fair Blog Party! I'm glad you stopped by, Val. I live this idea! I wanted to buy a winder box but they were too costly. I'll have to try this! It isn't as pretty as a wonder box, but it is just as efficient and a lot less money. Have fun with it! Thank you Kathi for your instruction! It's helpful for me! Thank you, Alexandra. I hope this helps to give you some peace of mind as winter approaches. It's a very efficient way of holding in the heat, isn't it? This would be a great way to incubate yogurt. I let it cook *all day* - I've never overcooked anything and so far I haven't undercooked anything either.